What does this mean, I have tried the VSS option which it does nothing to. 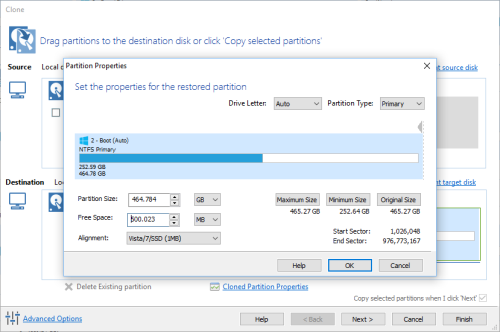 That's not come up before but it references the fact that an operation (either a partition delete or overwrite) is for a partition that can't be found on the target drive. 1. 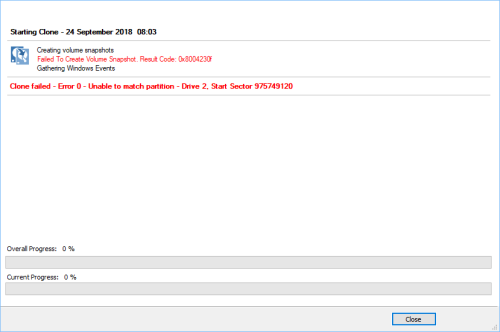 Hit the refresh link in the main Window to refresh the current drive layouts. 2. If that doesn't resolve the problem then edit the clone definition to correct the problem by setting up the clone again. . So, after creating the clone in the way I think it should be one, this is the result. From your screen shot we can see that Microsoft Volume Shadow copy Service (VSS) is failing. - Excluding writer 'SqlServerWriter' since it has no selected components for restore. I am running Windows 10. I will read the KB articles. Also, I had Acronis installed prior to running Macrium but I uninstalled it using Revo Uninstaller which should remove everything from the disk and registry. It could still be there somewhere, I will look into it. I will work on this in a few hours, I am at work just now. Thanks for your help. First and easiest thing to try is to take the 'Other Tasks' > 'Fix VSS Problems...' menu option in Macrium Reflect and reboot. I tried the menu option Fix VSS Problems, it did not work. Same result. I will keep looking on the internet.